Last fall I admired 3 unique and very different gourds that were decorations at a friend’s house. When the season changed to Christmas she gave them to me so I could have the seeds for this year. They were heritage seed so I knew the fruits should be good & produce. I love my garden for all the food it produces for us and others, but there is beauty in what we plant and even what just grows along the roadside that brings joy to the beholder as well. Well the gourd seeds were more that just good! From these three I have grown at least 15 different very unique shaped fruits. Some are tiny, others bigger, some shaped like a swan, some bumpy and others smooth. They are in shades of green, yellow, beige and orange. Lovely autumn colors! I have decorated at the road, in front of and inside the house. I have shared many with friends and family. We will take some to church & our seniors to decorate for Thanksgiving. And I still have a few boxes full! In fact they are still growing and producing. Maybe the frost last night will bring an end to this. This morning as I took my usual walk, I noticed how the leaves were quickly taking on autumn colors as well and some were gently falling to the ground. It reminded me of the gourds again and then I had an idea! 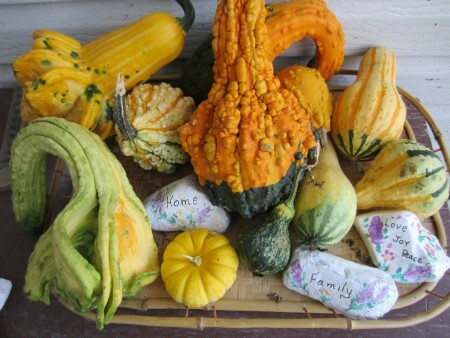 I will take seeds from some of the remaining gourds, wash and dry them and share them with others. I may take some to the Farm W omen’s Conference in November so other women can enjoy them next year! I seeded pumpkins as well, but the deer enjoyed most of them. I do have enough small ones that they left for me to make pies and muffins; but none for outside decorating! Last week I was out burning garbage. We have a spot away from the house in the deep grass where one can safely burn. I noticed something orange in the grass. Well was I surprised to find 3 large pumpkins. I have no idea where the seed came from and how it managed to survive through the heat of my fires all summer long. Besides the edible bounty in the garden that I am still taking out everyday, I am enjoying what I can see with my eyes and feel in my heart! Enjoy what you have been blessed with today!